Across the nation, accelerated bridge construction is speeding project delivery times, a goal of the Highways for LIFE program. ABC involves prefabricating an entire bridge near the actual site, then moving it into place in a matter of hours or a weekend. As well, some states are accelerating bridge construction by prefabricating major bridge components off-site, then hauling them to the bridge site and installing them. ABC techniques reduce on-site construction time, minimize traffic impacts, improve work zone safety, decrease environmental impact, increase bridge constructability, boost quality and lower life-cycle costs, said Lloyd Wolf, bridge design group leader at the Texas Department of Transportation. The Texas DOT has used ABC techniques for five years. "ABC is increasingly being used by several states, including Utah, Texas, Florida, Louisiana and New York," said Vasant Mistry, Bridge and Tunnel Team leader in the Federal Highway Administration's Office of Bridge Technology. "Utah is an especially good success story with ABC." Indeed, the Utah Department of Transportation has used accelerated construction techniques on some 80 bridges in recent years, said Jim McMinimee, Utah DOT director of project development. What's more, the agency is 80 percent of the way to making ABC standard practice for all bridges, a goal the state wants to achieve by 2010 or earlier. Utah would be the first state in the nation to do that. Last summer, the Utah DOT used self-propelled modular transporters to move 12 bridges into place, each as one large structure. SPMTs are computer-controlled vehicles that can move entire lengths of bridge superstructure into place in a matter of hours. Seven of the 12 bridges were on a $100 million urban reconstruction project on Interstate 80 in the Salt Lake City area. "For those seven bridges it took just 41 days to put all of them in place from the time we started," said McMinimee. "We believe we saved an entire construction season using the ABC method, and we estimate our highway user cost savings at $25 million for those bridges." Four other Utah bridges that used SPMTs were on I-80 between Salt Lake City and Park City. "For that project we replaced the four bridges with two weekend closures," said McMinimee. "The last SPMT project UDOT did was a bridge replacement at I-215. That last one was removed and replaced at I-215 and 3300 South in less than 16 hours." Last summer the agency completed a two-lane bridge on U.S. Highway 6 for which all components-from footings on up-were prefabricated. "On that one we saved a complete construction season by using ABC methods," said McMinimee. As well, Utah has been making rapid progress with ABC documentation. The state has hired a consultant to help write ABC standards. He's working with local contractors and fabricators to gain their input through a standing committee of the Associated General Contractors of America. "We have a running dialogue with a committee that was made up from our local AGC chapter," said McMinimee. Last fall, for example, the Utah DOT held a workshop to seek contractor input on accelerated construction. "One thing we've learned is that contractors can be very innovative in bringing forth ideas that help with constructability," said McMinimee. "We're really tapping into a lot of talent that our contracting industry has when we invite them to help with our standards." For 2009, the Utah DOT has identified four bridges to move into place with SPMTs. Two are part of the $130 million Beck Street project in Salt Lake City, where SPMTs will move two new ramp bridges into position. And at a $260 million project near the town of American Fork on I-15, SPMTs will transport two new interchange bridges. In Louisiana, the state Department of Transportation and Development used SPMTs to repair damage done by Hurricane Katrina to the I-10 twin bridges across Lake Pontchartrain. Fifty-four spans fell into the water and 473 spans shifted laterally. "By using the self-propelled modular transporters placed on barges, we shifted the spans back into position," said Hossein Ghara, state bridge design engineer. Ghara said Louisiana got the idea to use SPMTs from Florida, which had used them a year earlier to repair hurricane damage. "We watched them use SPMTs in Florida, so when the hurricane hit here, we knew what we had to do," said Ghara. Louisiana gave its contractor a 45-day deadline to move 527 spans. With the barge-mounted SPMTs, the contractor finished the task in just 35 days. "He had to take good spans from one side and place them on the other side so that we could open one of the twin bridges," said Ghara. "Then we replaced all of the bad spans and the spans that had been removed using Acrow steel spans. We were able to use the maneuverability of the SPMTs on the barge-and maneuver the barge itself." Texas has used ABC techniques on four bridges-one highway overpass and three railroad bridges. For a railroad bridge near Childress, the state built two new bridges near existing twin structures, then lifted sections of the old bridges away with cranes. The new bridges were rolled into place in a matter of hours. The Texas DOT also uses precast concrete components to accelerate bridge construction. The agency identified four bridges on Route 340 Loop near Waco for which a prototype precast design was formulated. The design incorporated pretopped U-beams, precast concrete column shells, and an innovative off-site preassembly method to reduce the impact for motorists caused by superstructure construction over the busy lanes of I-35. From Ghara's perspective, the benefits of ABC techniques need to be weighed against their costs. "It's not like if one scoop is good, two scoops are better," he said. "The fair way to figure it is to calculate highway user costs. If I can save the taxpayer 20 or 30 percent by spending an extra 10 percent to rent SPMTs, then it's worth the cost." For more information on accelerated bridge construction, contact Vasant Mistry at (202) 366-4599 or vasant.mistry@dot.gov. 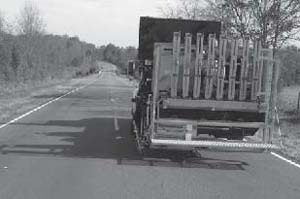 The automated pavement marker placement system fits on a truck and eliminates the need for a worker riding under the truck to apply markers by hand. FHWA's Carl Andersen observed the operation of the automated pavement marker placement system during a field test. A worker in the truck cab operates the system by remote control. One of the least-liked highway jobs is riding on a seat attached to the underside of a truck, inches from oncoming traffic, installing pavement markers by hand. The reflective markers boost safety by making it easier for drivers to see lanes in the dark, but installing them manually is risky for workers. With the help of a Technology Partnerships grant, Stay Alert Safety Services Inc. of Kernersville, N.C., is developing an automated system for safer installation of pavement markers. In a fall 2008 field test, the prototype's performance exceeded expectations for safety and reliability, paving the way for tests on road projects in 2009. "We're very pleased with the results of the field test," said Stay Alert Project Manager Tony Collins. "We're really beyond what we anticipated at this point." The Technology Partnerships Program, part of the Highways for LIFE initiative to accelerate highway industry innovation, provides funds to develop technologies at the prototype stage. The goal is to test promising technologies that cut congestion or enhance highway quality and safety in real-world settings and move them closer to the marketplace. 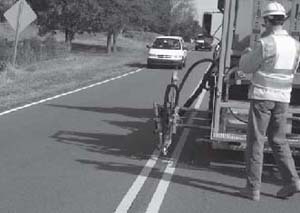 The automated pavement marker placement system, which fits on a flatbed truck, applies adhesive and drops markers into place with a robotic arm. A worker in the truck cab operates the machine by remote control. Stay Alert, working with Detail Technologies Inc. of Wyoming, Mich., and the University of Nebraska-Lincoln, refined its prototype to improve efficiency and reliability. Before the field test, Stay Alert staff conducted a workshop test of the improved prototype's marker delivery, positioning and installation operations. Satisfied with the prototype's performance, staff members tested it under normal traffic conditions on a four-mile (6.4-kilometer) stretch of U.S. Route 158 in Davie County, N.C. 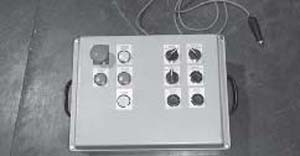 Overall, they determined that the system design is technically sound and that the machine is safe and reliable. Staff members debugged a few problems discovered during the test. For example, they recoded the control system to detect when a marker is jammed in the machine. Additional road tests found that the corrections resolved most of the problems, and Stay Alert plans to make further improvements before using the system on a marker installation project for the South Carolina Department of Transportation. "We've got a couple of minor refinements to make to the machine to make it more efficient and user-friendly," said Collins. "We're not far from a product that we can actually take to market." For an initial field trial, the test went well, said Carl Andersen, Federal Highway Administration Roadway Team leader, one of the independent observers who watched the test. "The system performed as designed, and at times worked as rapidly as existing procedures," he said. Andersen noted that a marketable automated system would remove workers from a dangerous and difficult job that exposes them to traffic, road dirt, engine exhaust and high temperatures from both the road and the bituminous glue pot mounted on the truck. "A fully functional automated system will permit faster, safer operations," he said. "The labor hours saved can be converted to additional installations and higher-level tasks." Also observing the test were representatives from a manufacturer of the pavement markers used in the system and the North Carolina DOT. "Even though Highway 158 is a curvy, two-lane road with higher-than-normal traffic, the automatic raised marker applicator did a great job of installing markers while providing safety to the workers and minimizing inconvenience to the motorist," said Timothy Inglis, senior government transportation safety specialist for 3M. Chris Howard, North Carolina DOT standards project design engineer, said he was impressed with the pavement marker system's first run. "What really stood out was the elimination of a person physically installing the markers," he said. "Any time we can eliminate people working in the center of the roadway is a plus." For more information on Technology Partnerships visit www.fhwa.dot.gov/hfl/partnerships, or contact Julie Zirlin at (202) 366-9105 or Julie.Zirlin@dot.gov. For details on the automated pavement marker placement system, contact Jim Babcock at (336) 993-2828 or jbabcock@stayalertsafety.com, or Tony Collins at (336) 993-2828 or tcollins@stayalertsafety.com. Highways for LIFE has created two ways to learn about innovation: a course on accelerating innovation deployment and Web conferences on innovations transportation agencies and industry are using to enhance the American driving experience. "Leap Not Creep: Accelerating Innovation Implementation" provides transportation professionals with the tools to put innovations to work quickly and make them part of an agency's standard procedures. The National Highway Institute course, scheduled to launch in 2009, is in two parts: a Web conference participants view on their computers, followed by a two-day session with technology transfer experts. The course covers the features of successful implementation, components of an implementation plan, resources for locating innovations, and strategies for overcoming barriers to adopting innovation. Highways for LIFE is also partnering with NHI on "Innovations," a monthly series on innovative technologies and practices that can be incorporated into highway programs. The free conferences are on the Web, eliminating travel and saving time and money over traditional training. Transportation professionals who want to learn more about using innovation can start with either the "Leap Not Creep" course or the "Innovations" Web conferences, said Kathleen Bergeron, marketing communications coordinator for Highways for LIFE. "They reinforce each other," she said. "You can learn how to incorporate innovative practices into agency operations through the course, and you can get the latest information on how specific innovations are being used through the monthly series." To register for the "Leap Not Creep" course, visit www.nhi.fhwa.dot.gov. To sign up for an "Innovations" Web conference, go to www.nhi.fhwa.dot.gov/about/innovationseries.aspx. Statue award for the 2008 MarCar Awards. The Highways for LIFE toolkit on prefabricated bridge elements and systems has won a MarCom Gold Award from the Association of Marketing and Communication Professionals. The award, which recognizes outstanding achievement in marketing and communications, goes to organizations throughout the world whose work serves as an industry benchmark. The winning DVD, "Promotional Kit for a Highway Technology: Prefabricated Bridges," includes two videos, four article reprints, a report on bridge technology decision making, a manual on self-propelled modular transporters and Web links. It was created in DVD form so it can be updated and distributed easily as new materials on the technology become available. For a copy of the DVD, contact Lizzie Morris at (202) 366-0131 or Elizabeth.Pollock@dot.gov. For more information, contact Julie Zirlin at (202) 366-9105 or Julie.Zirlin@dot.gov. Using innovative techniques to limit bridge closure time to a week instead of months, the South Carolina Department of Transportation will rehabilitate the historic Ben Sawyer swing bridge spanning the Intracoastal Waterway. This is South Carolina's second Highways for LIFE project, and it is being funded in part by a state match waiver-100 percent federal funding-rather than a Federal Highway Administration grant. The bridge's rehabilitation includes a new superstructure, substructure repairs and modifications, and new mechanical and electrical systems. The existing bridge crosses the Intracoastal Waterway between Mt. Pleasant and Sullivan's Island in Charleston County. The 1,151-foot-long (351-meter-long) bridge consists of a 247-foot-long (75-meter-long) center pivot, modified Pratt through-truss and 452-foot (138-meter) approach spans. The operator's house, located above the travel way on the center span, is staffed 24 hours a day. The center span pivots to permit watercraft, mostly recreational boaters, to pass by the bridge. PCL Civil Constructors of Tampa, Fla., won the $31.5 million design-build contract to replace the deteriorating bridge, built in 1945. Because of its age and engineering significance, the bridge is eligible for the National Register of Historic Places. For that reason, federal and state authorities agreed to require the new superstructure to closely resemble the existing bridge aesthetically. Construction of a temporary trestle system was scheduled to start in February, said Tad Kitowicz, Operations Engineering Team leader for FHWA's South Carolina Division. The contractor will build a temporary trestle along each side of the bridge's approach spans. The southern trestle will be used to accept the existing approach superstructures, while the northern trestle will be used to construct the new superstructures. Meanwhile, construction of a new steel center swing truss will proceed off-site. In a South Carolina project using accelerated construction techniques, the new bridge superstructure will be floated into place on barges. The seven-day closure is scheduled to begin Nov. 10, 2009. During that time, the contractor will jack up the old approach spans and roll them onto the temporary trestle on the southern side. Once that operation is complete, the new approach superstructures will be rolled into place on the rehabilitated substructure. During the same 168-hour closure, barges fitted with falsework will float under the existing center span at low tide. By using the rising tide and releasing water as ballast to raise the barges, the contractor can lift the old center span from its substructure, rest it on the barges, and float it away. The same process will work in reverse to place the new center span. Barges with the center span aboard will float into place at high tide. As the tide falls and the barges take on water as ballast, the barges will lower the new superstructure into place. This technique will save months of bridge closure time, said Kitowicz. It simply would not be feasible, he said, to close the bridge for several months, demolish the old superstructure and replace it. Using the only other access between the mainland and Sullivan's Island adds nine miles (14.4 kilometers) to each leg of a trip to the island. The November closure date was chosen in part because it avoids the tourist and hurricane seasons. "Based on the issues involved, this method provides the least impact to the traveling public, minimizes disruption to the local community, and provides the greatest extension of the bridge's service life," said Kitowicz. For more information, contact Tad Kitowicz at (803) 253-3882 or Thaddeus.Kitowicz@fhwa.dot.gov. 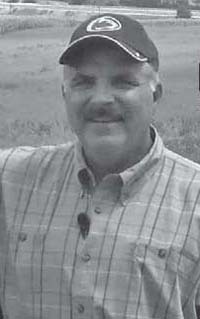 Pennsylvania DOT official, Gary Hoffman. "A Daunting Challenge," a new video on the Highways for LIFE initiative, is spreading the word on how the transportation community can harness innovation to improve the way highways are built. The following are highlights from the video, narrated by Gary Hoffman, retired deputy secretary of highway administration for the Pennsylvania Department of Transportation and a consultant on the Highways for LIFE project. The nation's highway system faces a perfect storm. "The needs to renew the system are tremendous, and all we have to do is look at the conditions of our bridges to see that," Hoffman explains in the video. "That renewal has to take place under tremendous traffic-traffic that has to be maintained during construction." At the same time, highway construction costs have increased dramatically-as much as 70 percent-over the past few years while revenues dedicated to highway construction have remained flat or decreased. "There was a time when we could afford to do things the same old way, but not anymore," Hoffman says. "Our industry has got to quickly put into practice new technologies and innovations-innovations that are proven and that will build highways better, faster, with less intrusion on traffic, safer-and oh, by the way, less expensively." To help meet today's transportation challenges, the U.S. Congress established Highways for LIFE, a Federal Highway Administration pilot program, in the 2005 Safe, Accountable, Flexible, Efficient Transportation Equity Act: A Legacy for Users (SAFETEA-LU). The initiative features several components, including grants for construction projects that use innovations that enhance safety and quality while cutting traffic congestion. The Minnesota Department of Transportation used a full road closure to rebuild part of a major arterial that included a busy interstate interchange. As a result, the work was completed in one construction season, rather than two or three. In Salt Lake City, the Utah Department of Transportation used prefabricated bridge systems to build a new structure near an existing bridge while traffic fl ow continued unobstructed. The old structure was removed and the new one moved into place in one weekend. State agencies in South Carolina, Georgia and Maryland used prefabricated bridge elements from the foundations to the deck that are put together in the field like Legos®. These bridges go together faster and last longer. "State transportation agencies have been great about trying these innovations on their highways, but FHWA could see that working in one state at a time might take a while," Hoffman says. To speed up technology transfer, FHWA developed a new, more aggressive approach and tested it with several innovations: prefabricated bridge elements and systems, road safety audits, precast concrete pavement systems and techniques to improve work zone traffic control. Under the approach, FHWA set up teams of specialists to develop marketing strategies to encourage fast, widespread adoption of the innovations. The strategies include technology transfer tools such as peer-to-peer exchanges, demonstration projects and video conferences. Technology Partnerships, another facet of Highways for LIFE, provide funding to private industry to move promising technologies to the marketplace. So far, five new approaches are being developed under the program, and more are coming in 2009. FHWA shares the program's mission and activities through communication tools such as websites, brochures, trade show exhibits, the Innovator newsletter, and articles in trade and consumer publications. As a result of Highways for LIFE, Hoffman notes, states are beginning to implement innovations as standard practice. "These Highways for LIFE technologies and approaches are proven. They're working. It's not just about a project or a product. It's about changing a paradigm to always look for the best solution," he says. "When I started in the highway building business 35 years ago, we built new highways on new alignment. But today's challenges are just as daunting. It's rebuilding that system under tremendous traffic loads. It's looking for better ways, higher quality and longer-lasting materials. It's looking for ways to construct faster with less intrusion on the motorist. It's looking for ways to improve safety. It's looking for ways to do things more efficiently and less expensively." The video ends with a call to action from Hoffman to highway community colleagues: "We have a challenge before us, a daunting challenge. So I might ask: 'What role are you going to play in this vital endeavor?'" Learn more about the Highways for LIFE program and how it can improve the way agencies and other stakeholders deliver highways by visiting www.fhwa.dot.gov/hfl. Implement performance goals for your construction projects that address safety, quality, congestion and customer satisfaction. Consider incorporating innovations you've never or rarely used into projects you have scheduled. Add a placeholder to your project delivery process for setting project goals and considering innovations. Ask the Federal Highway Administration Division office to host a discussion with your staff about innovative practices to build roads safer, faster, better and less expensively. Get specifics on successful projects that have used innovations on the Highways for LIFE website. Participate in a workshop on "Performance Contracting for Construction" or "Seeking the Best Solutions." Contact Mary Huie at (202) 366-3029 or mary.huie@dot.gov for details. Attend a project demonstration showcase. See the schedule at www.fhwa.dot.gov/hfl/projects. Host a session of "Leap Not Creep: Accelerating Innovation Implementation," the Highways for LIFE/ National Highway Institute training course on making innovation part of an agency's standard practice. See www.nhi.fhwa.dot.gov. Participate in the monthly Highways for LIFE-sponsored Web conferences on innovation. Go to www.nhi.fhwa.dot.gov/about/innovationseries.aspx. Host a workshop on accelerated construction technology. Information is at www.fhwa.dot.gov/construction/accelerated/workshop.cfm. Consider using accelerated bridge construction techniques in your agency's bridge program. See how the Utah Department of Transportation is doing it at UDOT ABC Workshop Report. Sign up for training in conducting road safety audits at the NHI website. 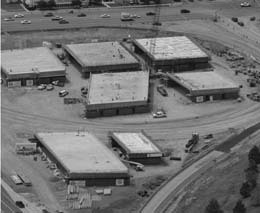 Study the applicability of precast concrete pavement systems for upcoming projects. View the "Precast Concrete Pavement Systems Videoconference" DVD, available from Lizzie Morris at (202) 366-0131 or elizabeth.pollock@dot.gov. Take advantage of the peer exchanges on making work zones work better (ops.fhwa.dot.gov/wz/p2p/index.htm) and road safety audits (safety.fhwa.dot.gov/rsa/resources/p2p_brochure.cfm). Talk to your FHWA Division about applying for funding for a Highways for LIFE demonstration construction project. Learn about Technology Partnership projects to move promising prototypes to market-ready technologies. See www.fhwa.dot.gov/hfl/partnerships or contact Julie Zirlin at (202) 366-9105 or Julie.Zirlin@dot.gov. Learn about the efforts of the American Association of State Highway and Transportation Offi cials Technology Information Group, which is working with Highways for LIFE on innovation deployment. Visit http://aii.transportation.org/Pages/default.aspx?siteid=57. Attend a Technology Research Board session on technology. See the calendar www.trb.org/calendar. Subscribe to FHWA's Innovator newsletter about innovation in the highway industry. Send your name, mailing address and e-mail address to HfLT@dot.gov.